Financial emergencies seem to happen at the worst possible moments. The state of our economy over the past few years has left millions of people without a financial cushion to rely upon when a monetary crisis occurs. An unexpected car repair, a broken water heater, a bill that absolutely must be paid immediately - whatever the circumstances, cash loans can be a financial live saver and can provide you money within a short period of time. Because these loans have an extremely short repayment time (normally two weeks or your next payday), they should not be considered as a solution for long-term financial problems or overwhelming debt. CashLoan.org provides everything you wish to know about quick cash including payday reviews on the largest companies, financial articles and state guides. Visit How It Works to learn more or Frequently Asked Questions. We do not make credit decisions or extend any type of credit. But we help consumers just like yourself who are facing an immediate cash-crisis by matching you with a reputable short-term lender. Our referral service is free of charge. Even if you have less than perfect credit or no established credit at all, CashLoan.org will strive to match you with a payday lender who can provide the funds you need until your next pay day. The amount of funds generally available range from $100 to $1000. Not all lenders can provide the maximum amount and there is no guarantee once you apply how much you will be approved for. Every lender has their own set of rules and regulations when making the loan approval decision. CashLoan.org does not play a role or have any influence in this process. Each lender makes their own determination on whether to approve a loan request based on the information which you provide on your application. Think carefully before signing any loan agreement. 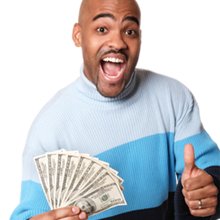 You should be confident that you will be able to repay the loan in full by your agreed upon date. Always read the terms and conditions carefully and remember you are never under any obligation to accept any loan until you confirm and sign with your e-signature.